enjoyed them very much thank you. written with much tongue in cheek humour, and enough suspense to make this series an enjoyment to read. 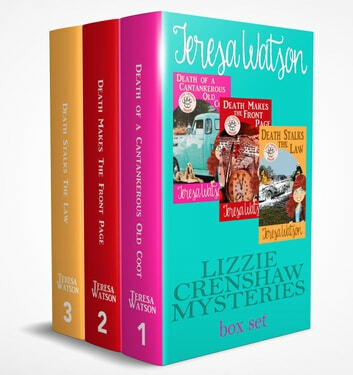 look forward to getting more lizzie Crenshaw mysteries in the future. l enjoy a good detective novel that is not too complicated and this series fitted the bill for me. would like to see more from the lizzie Crenshaw mysteries. A very enjoyable book. Fast paced full of interesting twists and great endings. Would love to see this as a TV series. This set of stories was a very interesting and page-turning read. Hard to put down. I will be looking for more of Lizzie's adventures. Really enjoyed the stories, clever and fun writings. Just the sort of books to read when you need to relax and not think too deeply. Enjoyed the twists and the humour.